Plot After the Chinese won the Indo-Sino War in 1962, they try to infiltrate India via Sikkim, but this time, Maj. Gen. Sagat Singh does not want to be at the receiving end. He sets up a platoon with the best jawans in it to be posted at the border to give the Chini counterparts a tough fight. So, do situations turn out to be like 1962 or is 1967 different than it was five years ago? Each time an Indian soldier shouts sarvada shaktishali on the big screen, your adrenaline starts to pump faster and the hair on your body start to stand on end. That is the kind of magic director J. P. Dutta has come to cast on his audiences with his recent release ‘Paltan’. 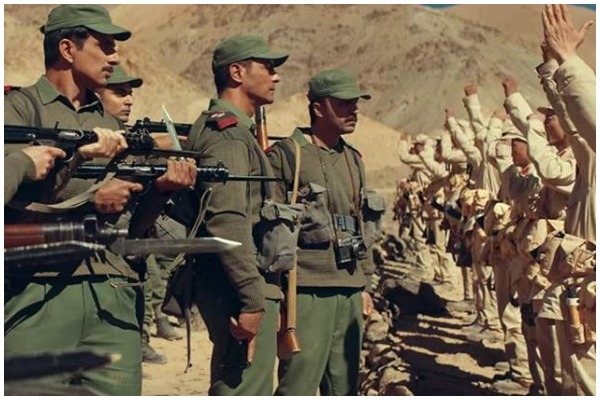 A part-fact, part-fiction tale of war, based on post events of the Indo-Sino War of 1962, his film is an honest effort in bringing forth an untold story. But with too many tales interwoven together and a lot of clichéd scenes, the movie only turns out to be a disappointment in the end. In the year 1967, five years after the Chinese have won the war over India in 1962; they eye to invade Sikkim to make an entry into India through Nathu La. Maj. Gen. Sagat Singh (Jackie Shroff), who does not want to give in to his Asian neighbours this time, gets whiff of the Chinese plans and so he rounds up a squad to be posted on the North-east Indian border to defend the nation. Lt. Col. Rai Singh Yadav (Arjun Rampal), along with his platoon of men – Maj. Bishen Singh (Sonu Sood), Capt. Prithvi Singh Dagar (Gurmeet Singh Choudhary) and Attar Singh (Luv Sinha) – are sent to Nathu La, which is the gateway to India from the Chinese side. Maj. Harbhajan Singh (Harshvardhan Rane) is already posted at the border when the paltan begins rolling in. Amid a few squabbles, a war-like situation starts to brew between the two neighbouring nations, which eventually turn into a war. And this time round, the Indian jawans refuse to take things lying down. J.P.Dutta’s multi-starrer ‘Paltan’ is yet another film that captures the war proceedings in all earnestness, giving you goose bumps every now and then, yet the director fails to make an impact like he did with his 1997 war-drama ‘Border’. Specializing in narrating war stories that are lesser known to people, Dutta tries his best to add minute details in the script, but that takes away the audiences’ interest by the time the film reaches its climax. A lot of back stories of characters right in the middle of war scenes cause a hindrance and mar the pace of the movie. The film is painfully long, which the editing team could have taken into consideration first thing first. Neither does Annu Malik’s music create any magic nor do the songs arouse a feeling of patriotism. Sanjoy Chowdhury’s background score manages to stay with you but with the loud noises of war in the foreground, it dies down way too quickly. The screenplay is good and the multi star cast put up a great show. But it is only Jackie Shroff and Harshvardhan Rane that stand out in the crowd with their acting skills. Jackie is first-rate as the top boss while Arjun as the second in command is composed and Sonu plays his part with conviction. But the surprise package is Harshvardhan Rane who is the best of the lot. All the other actors seem like support crew and are lost in the long list. The leading ladies do not have much to do either, except look good and pine for their loved ones in the highest service of the nation. The scenes between the jawans and their women, too, are not etched out properly. Dutta has tried to add in too much at one time and that is where the problems start to creep in. The flow of the story is hampered due to the jumping of scenes from flashback to present and war to romance, which is quite an eyesore. The lackluster Chinese army is caricaturish and the frequent chanting of ‘Hindi-Chini Bhai Bhai’ becomes too jarring after a certain point of time. All in all, ‘Paltan’ is a story that needs to be told to every Indian to remind him of the country’s rich heritage; but minus the melodrama, the exaggeration and a few scenes that come straight out of ‘Border’, ‘Paltan’ would have been as endearing. Next : Saath Nibhaana Saathiya Producer Rashmi Sharma Blessed With Twins Via Surrogacy!